Home » H.A. 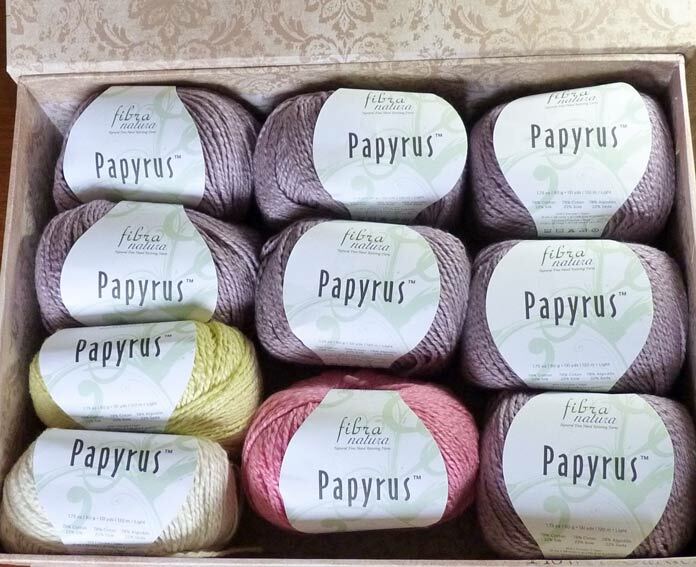 Kidd knitting supplies » Papyrus – cottony soft knitting! Papyrus, the yarn for this week’s assignment, came at the same time as the Radiant Cotton I reviewed back in March. So it took a couple of months for me to get back to it. Did I ever get a lovely surprise! A decorative box in cream and gold is the perfect work box for Papyrus’ luxurious softness! Papyrus is not a blend of cotton and silk – it’s made of strands of cotton and silk. The cotton is very softly spun in a “Z” direction. The silk is spun quite firmly in the same direction, but it’s much thinner than the cotton strand. Silk gives Papyrus its strength. Without it, the softly spun cotton fibers (each of which is about the length of a memory card for a camera) would drift apart. One strand each of the cotton and silk are then twisted together in the “S” direction. The tightly twisted silk serves as a binding thread to trap the softly spun cotton fibers into place, keeping loft in the super soft cotton. But, that’s only half the story! A second of these cotton and silk twists are twisted together to make the full, double-knitting weight yarn. Interestingly, these two strands are also twisted in the “S” direction. On the left is the full double knitting strand of Papyrus. 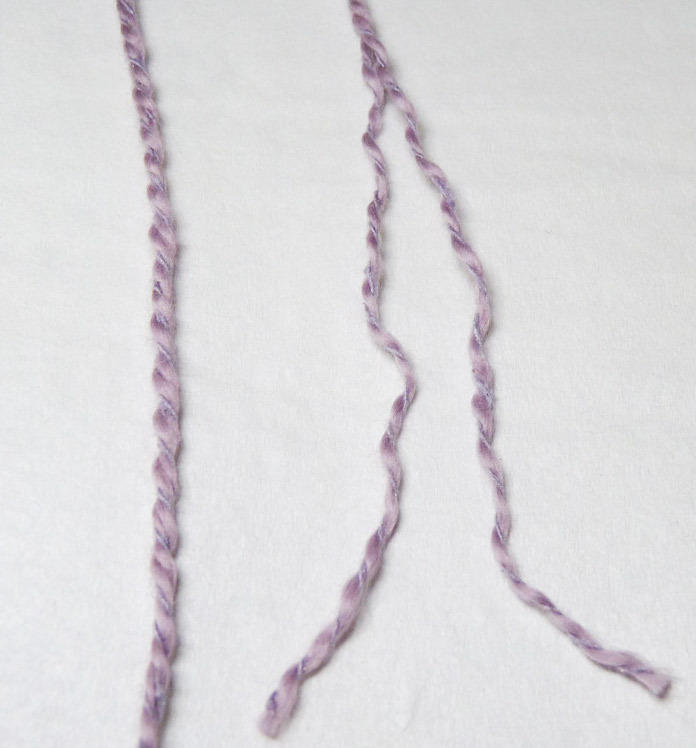 On the right, the two “S” twists have been separated out to show the thin, silk plies and how they trap the lofty, soft cotton fibers. Ordinarily, a yarn needs to be spun in the opposite direction each time. Most knitting yarns, if you look at them have a dominant “S” twist. The fibers in each ply have been spun “Z,” then they all get twisted in the opposite (“S”) direction to balance the yarn. At spinning demonstrations, I compare it to spinning around on a swing. When we spin, we put energy into the ropes of the swing, and, when we let go, the energy tries to balance itself back out, so we “unspin” in the opposite direction. With Papyrus, the process begins with one twist of “Z” spun singles, that are twisted “S” as per usual, but then, two of these “S” twists are twisted together also in the “S” direction. Ordinarily, this gives what is called an “energized yarn” which would be very springy and could even coil into little twists on the surface of the knitted fabric, but because neither cotton nor silk have a lot of memory, it works, making a beautiful, soft yarn with a fabulous drape. 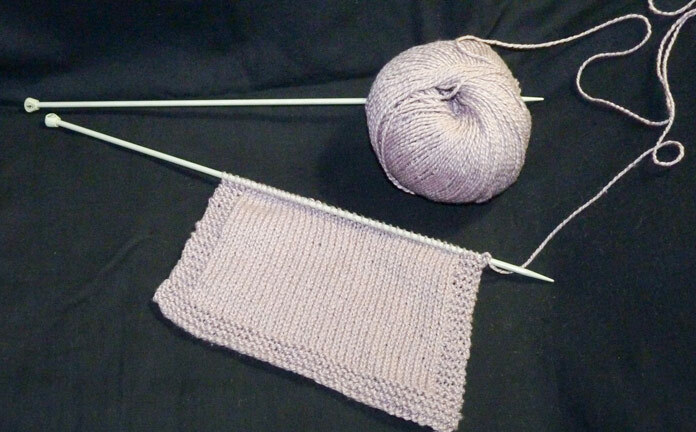 When a yarn is out of balance, it will often “skew” in the knitting, which is to say that a stockinette stitch piece will lean like a parallelogram. Sometimes it’s severe and sometimes it’s minor. Sometimes it can be blocked out. I’ve done so much swatching for yarn reviews over the last 16 years, I’ve had to get creative and try to make them do dual duty. Tomorrow, I’ll get you knitting for a cause. Join me tomorrow to see what this swatch wants to be when it grows up.